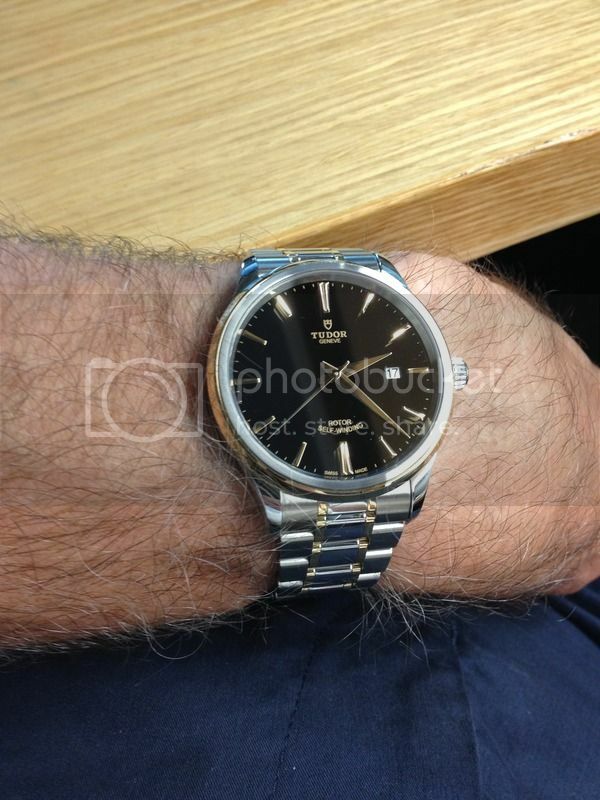 I bought a two-tone Style on bracelet from my local Tudor AD this past weekend. I intend to write a review of the watch in the weeks to come, but I thought I'd share a few early remarks. My first remark is I really like this watch. Its Rolex DNA is evident in the shape of the case (DJII) and the deep-space-black lacquered dial (Submariner). The side of the case is brushed and possesses a refined satiny sheen. The two-piece bezel is nicely finished as well. The gold piece is polished, and the SS piece (immediately next to the crystal) is brushed. The polished indices tastefully catch and reflect light, and the print on the dial is gold, which I think harmonizes well with the gold indices. I like the white background for the date display as well. Finally, the bracelet is comfortable and very nicely finished. Only the thin inner links are gold, and the clasp is cleverly integrated into the bracelet. Although it has a safety clasp, it looks almost as seamless as the clasp on a President bracelet. I feel like I got a lot of watch for my money, and it has a screw-down crown and 100m of water resistance to boot. What's not to like? Next Topic: Any word on the new pelagos?